installations. To get around this, Dooley Enterpristes has developed an adapter that allows us to produce pans for virtually any application needed. 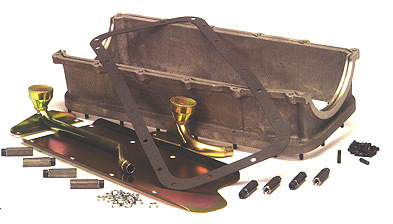 All pan units will include the adapter, windage tray, picup, mounting hardware for the pickup and tray, pan to adapter gasket, studs and nuts for pan to adapter and the proper pan for your application. 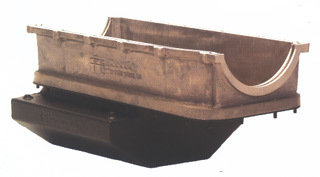 Because the rail is symmetrical, the only difference in the full length 10 and 14 qt. oil pans is the pickup. The baffles are located in the pan in such a way that if a jet out drive or standard flywheel tothe rear automotive picup is installed, the pan will only go on the proper direction. The same is true for the flywheel forward or V-drive application, the pickup dictates the direction the pan is installed. Both pans also have provisions to use the stock Chevrolet 'drain plug' type dipstick. Don't forget to remark the dipstick once installed with the proper amount of oil in the pan, i.e. - 10 qts. in the pan for a 10-qt. unit.